Lice, also known as Pediculus capitis, have been around for many thousands of years. They are extremely contagious, especially where kids are found in groups such as schools, daycare centers, camps, parties, sleepovers, etc. It is estimated that 25% of children will get lice during their childhood and is the second most common reason for school absence in the United States. 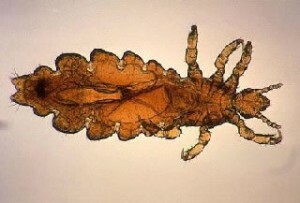 Lice are very small (1/32 to 1/16 of an inch), 6-legged, wingless parasitic insects which live only on the human head. When fully grown they can reach 1/8 of an inch. They do not live on pets or other areas of the body. They feed on human blood and will starve if off the human head for 24-48 hours. Lice range from reddish brown to gray in color. A nit is a louse (singular for lice) egg that is attached to the hair shaft, usually within 1 inch of the scalp. It is light colored and firmly attached to the hair. It will not fall off the hair if flicked or combed. Dandruff, hair products or dirt can be mistaken for a nit. The nit will hatch within 7-10 days and be fully mature from 9-12 days after hatching. Prior to reaching maturity a louse is known as a nymph. After hatching, the nymph must feed within 45 minutes or it will starve to death. Lice are fast little buggers and can be difficult to spot on the human head. They prefer the nape of the neck and behind the ears. More often the nits are more readily detected than the lice. Lice do not like the light and will scurry to hide. Persistent itching is the most common symptom of head lice. The itching can be so severe that it disrupts sleep, making it very difficult to even fall asleep. Itching is most common at the nape of the neck, and behind the ears. There may be tiny sores on the scalp or a rash at the nape of the neck due to the constant scratching. Some people do not itch but can still have lice. Therefore, it is important to get checked for head lice if you have these symptoms or have been closely exposed to a known case of lice. It is vital that everyone in the household be checked for lice to prevent continued re-infestation. Lice are not dangerous and do not transmit disease. However, they do cause severe itching which causes excessive scratching and possible open sores that can get infected. Therefore, it is important to receive treatment as soon as possible. Curing lice today so you can get back to your life tomorrow.